At first glimpse San Francisco seems a challenge for anybody with mobility issues. After all, hills aren’t very wheelchair friendly. And although there’s certainly no shortage of steep streets in the City by the Bay, there are also some very level and accessible areas. Take the Embarcadero and Fisherman’s Wharf area, for example. Not only is this popular tourist haunt very level and accessible by public transportation, but there’s also a wide variety of attractions to choose from along the way. There’s no doubt about it, public transportation is the easiest way to get around the city, and in that respect BART (www.BART.gov) — the local regional rail service — tops the list. All BART trains feature roll-on access, with wheelchair spaces located near the doors. Additionally, all BART stations feature elevator access. 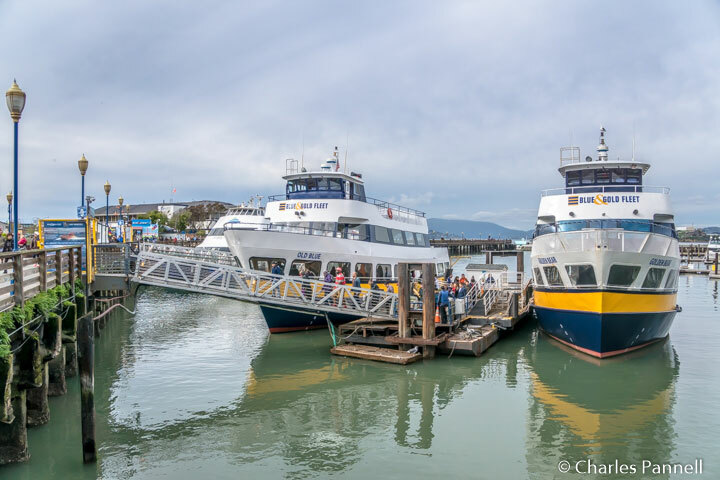 The Embarcadero BART station is conveniently located near the F-Line Streetcar stop at Main and Drum, so it’s easy to get to Fisherman’s Wharf in two accessible legs. Riding the F-line is fun too, as these vintage streetcars have been lovingly restored to their previous glory. And unlike the iconic cable cars, the F-Line Streetcars feature wheelchair access via raised boarding platforms along the route. In short, it’s a very nostalgic way to get to Fisherman’s Wharf. On the other hand, if you’re not near a BART stop, you can opt to take a cab down to Fisherman’s Wharf. Currently the most reliable accessible taxi company in the area is Luxor Cabs (www.luxorcab.com), which has a fleet of ramped taxi vans. After you take in the views at Fisherman’s Wharf, follow the accessible sidewalk up to Pier 39 for breakfast at the Eagle Cafe. The eatery is located on the second floor, and the elevators are tucked away under the bridge on the right. This landmark cafe has been serving hungry diners since 1928, and it’s know for its generous portions, so it’s the perfect place to fuel up for the day. Next door you’ll find level access to the kiosk for the Blue and Gold Fleet (www.blueandgoldfleet.com), which offers an informative and accessible cruise around the bay. There’s level access to the boat and wheelchair access on the main deck, where the accessible restrooms and the snack bar are located. This 45-minue narrated cruise heads out under the Golden Gate Bridge, then cruises around Alcatraz before it returns to the dock. And along the way it offers a good introduction to the history and the culture of the City by the Bay. After you’ve seen the bay from above, save some time to explore its deeper reaches at the Aquarium of the Bay (www.aquariumofthebay.org) on Pier 39. There’s a flight of stairs up to the main entrance, but there’s also an elevator to the left of the stairs. Inside there’s barrier-free access around the exhibits. The top floor includes a nice sampling of fish found in the bay, while the lower level includes 300 feet of crystal clear tunnels under the bay. 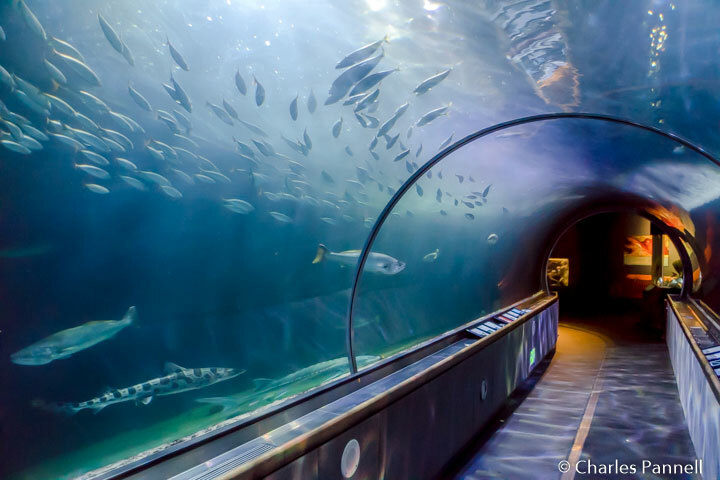 There’s barrier-free access to the lower level with wide pathways through the acrylic tunnels, which can accommodate even the largest wheelchair. The Nearshore Tunnel features fish of the bay, while the Offshore Tunnel offers a collection of skates, rays and sharks. Try and schedule your visit at feeding time, as that’s when the fish are most active. Top off your visit with a stop at the touch pools and ecological exhibits on the second floor. All in all this mid-sized aquarium presents a comprehensive overview of the marine inhabitants and ecosystems of the region. After you’ve had your fill of underwater fun, hop on a F-Line Streetcar across the street from Pier 39, at Beach and Stockton Streets. Next stop — Pier 15, the new home of the Exploratorium (www.exploratorium.edu). This interactive museum presents educational exhibits on science, art and human perception, that truly challenge your mind. And although there’s no shortage of kids at this playground for you mind, it’s also lots of fun for adults — even those without kids in tow. There’s level access to the front entrance and barrier-free access throughout the galleries. Most of the exhibits are constructed at wheelchair-height, so it’s really quite inclusive. Accessible restrooms are located in the lobby, and a family restroom is located near the first gallery in the atrium. 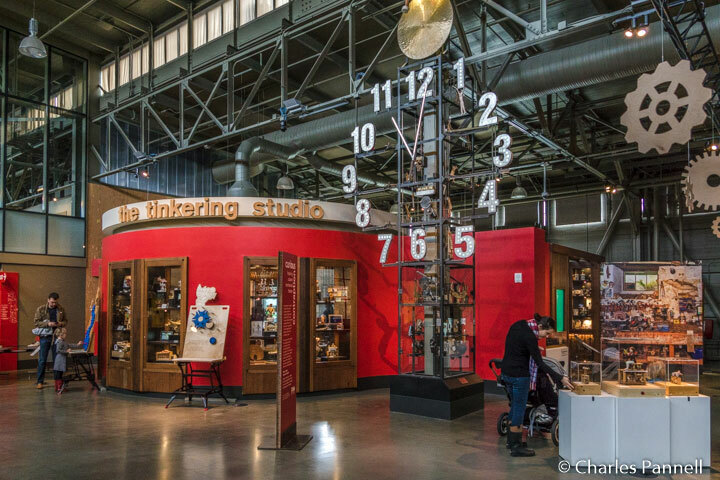 Exhibits range from those on the science of sharing and tinkering, to some that focus on the mechanics of vision, sound and hearing, with a little bit of everything else in between. 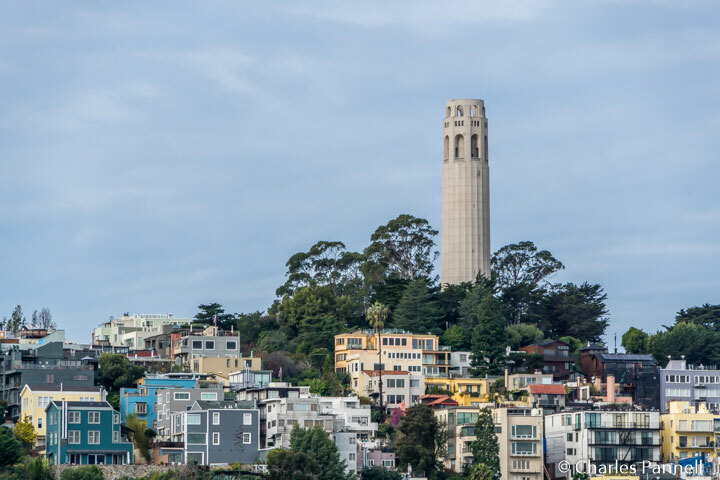 And don’t miss the Bay Observatory Terrace — which features elevator access — for a splendid view of San Francisco Bay. Additionally, the Sea Glass Restaurant, located at the east end of the museum, makes a nice lunch stop. It’s not frequented by the school groups, so it provides a quiet respite from the museum hubbub. It offers a lovely ocean view, has good pathway access, and the menu includes a nice selection of sushi, salads, hot dishes and sandwiches. 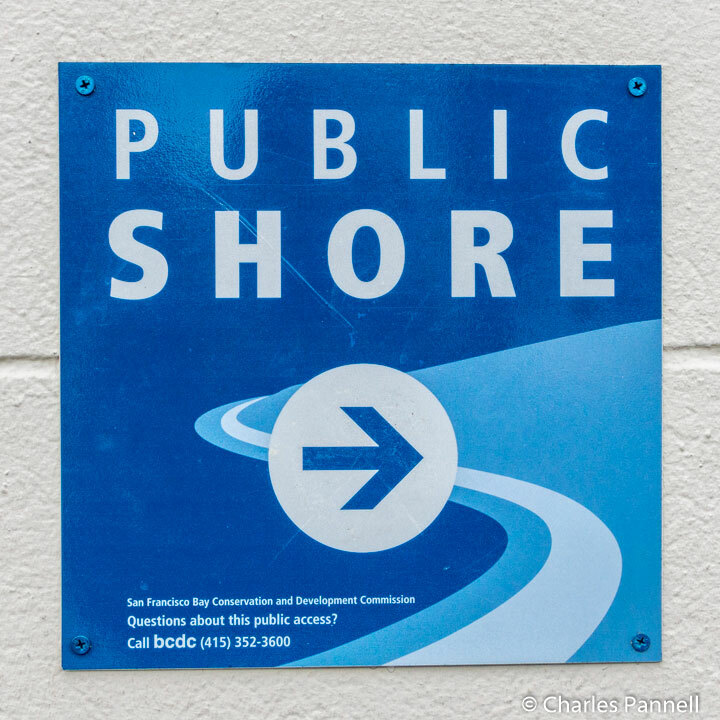 If you are up for a little walk, then follow the Public Shore signs at Pier 17 next to the Exploratorium. This accessible path leads around the back of the Exploratorium to the bay, and features a number of interactive Exploratorium exhibits along the way. It’s just a short half-mile walk on a level sidewalk, but the bay view is definitely worth the detour. Once you reach the Embarcadero, you can either turn left and follow the sidewalk along the street, or look for the Public Shore signs and opt for the scenic route along the bay. Either way is accessible, and soon you’ll find yourself at the historic Ferry Building (www.ferrybuildingmarketplace.com). Opened in 1898, the Ferry Building was once a transportation hub for passengers arriving in San Francisco by train and ferry. Sadly with the development of local roadways and bridges, the popularity of the Ferry Building fell off in the 1950s. It was subsequently gutted and converted to office space. 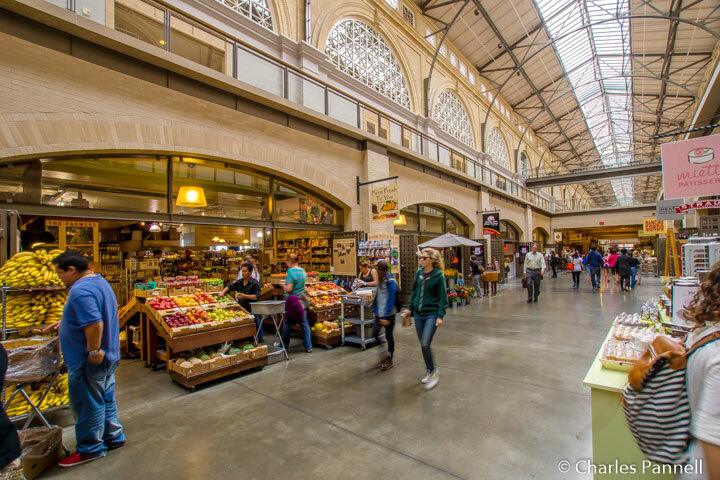 The building was later renovated to its prior glory some 50 years down the road, and it reopened in 2003 as The Ferry Building Marketplace. Today it houses a mouth-watering collection of tenants who offer everything from coffee, biscuits and cheese, to mushrooms, chocolate and even wine. Add in some locally sourced restaurants and a few specialty shops, and you have a complete gastronomic marketplace. Access inside this historic building is good too, with barrier-free access to all the vendors, and spacious accessible restrooms on site. Take your time and wander through the building — sample some cheese, have a cup of coffee and admire the beautifully restored interior. And when you’re ready to call it a day, the Embarcadero BART station is just a short level walk across the street from the Ferry Building. Alternatively, you can hang out at the Ferry Building and nosh a little more. The choice is entirely dependent on your stamina and your schedule. Either way, this San Francisco landmark is a fitting end to an accessible day in the City. Lastly, if you’d like to rack up some savings on San Francisco attraction admissions and transportation, don’t forget to pick up a CityPASS (www.citypass.com) ticket book. Priced at just $89, this money saving pass is good for admission to all of the attractions in this article, as well as unlimited rides on the F-Line Streetcars for three consecutive days. Plus it’s also good for admission to the California Academy of Sciences — which includes the Steinhart Aquarium and the Morrison Planetarium — in Golden Gate Park. The San Francisco CityPASS is valid for nine days, so you’ll have plenty of time to explore all the included attractions. CityPASS ticket books can be purchased online, or at any participating attraction. Best of all, you can save up to 42% with the San Francisco CityPASS. So not only is San Francisco very accessible, but it can also be quite affordable when you have a CityPASS in hand.